PLOT: The Simpsons go to Itchy and Scratchy Land when the robots go haywire and take over the park. This is what you get when the writers of the Simpsons take on the monolith that is Disney World. Mix in a little Jurassic Park (or Westworld) and what you get is a hilarious episode that is a surprisingly good action tale. The plot is simple: The Simpsons decide to take their family vacation to Itchy and Scratchy Land, which is basically a thinly-veiled excuse to make fun of the Disney Corporation and its founder. Bart and Homer waste no time misbehaving at the park and get in trouble, until the robots go nuts and terrorize the patrons of the park. The finale goes into full action mode as the Simpsons try their best to save themselves and the park once they discover the one weakness the robots have. I’ll just reiterate how much I love an episode that goes outside the boundaries of Springfield. It really broadens the world the writers have to play with and its where it really shines. The laughs are non-stop in this episode, and Disney gets a pretty big beating, which is funny to see. There are no character turns in this one. This is just pure Simpsons comedy, which is always great. Don’t think too much about it, just enjoy. PLOT: Employees of the Nuclear Power Plant go on strike after Mr. Burns takes away their dental plan. What can I say about this episode? This is as inspiring as a Simpsons episode can get and one of the most scathingly satirical episodes in the history. Its also one of the few times, as a fan, that you can be truly proud of Homer, as he rises to the occasion and makes a difference in his microcosm of a world. 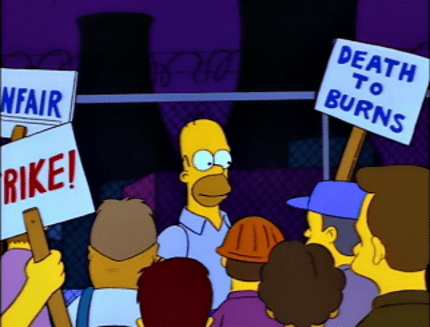 The plot is pretty straight forward: The employees lose their dental plan and Homer is appointed Union President and initiates a strike. Its not goofy, as most episodes are, but that is one of the things that makes this episode so special. It treats the plot very seriously, as does Homer, who becomes a true hero in this episode. In a life of failures, this is one of his greatest successes. The episode is still hilarious, as serious as it is. It creates one of the most iconic moments in the show’s history and I only need mention two words: “Dental Plan!” Not to mention Lisa’s song is a haunting, beautiful rallying cry that still sends chills down my spine every time I hear it. PLOT: Bart falls for Reverend Lovejoy’s daughter, only to find that she’s a little more than he can handle. Very few times have we actually gotten to see the vulnerable side of Bart. He’s fallen in love a few times, had a crisis of identity a few other times, but more often than not, most episodes revolving around Bart deal with his trouble-making ways. This is a completely different episode. Comparatively, Bart is on his best behavior here, as he tries desperately to win the affection of Jessica Lovejoy. Unfortunately for him, though, she’s not interested in the good guy version of Bart; she likes him bad, but even more bad than he’s willing to go. I love seeing Bart in a situation that he can’t keep up with. Often we see him as a master of his own fate; he’s always the one with the quick-wit answer and rarely is behind the 8 ball. Here, its amazing to see him struggle to keep his sanity in one of his first forays into love. It’s a very human, very adult, turn for him, as he recognizes how bad Jessica is for him, but can’t help falling into her trap over and over again. Obviously, I love the story, but what makes this episode an all-timer is the voice work of Meryl Streep. To me, this is one of the greatest guest star roles the show has ever had. She’s unrecognizable and to think that one of the greatest actresses of all-time completely immerses herself into a one time role on an animated series just speaks volumes to the importance of the show. Jessica is a fully-realized character, one of the most dynamic the show has seen. The character is so good, you almost wish that she was a regular. That’s the mark of a great character. PLOT: Homer tries to impress his new co-worker, Frank Grimes, but his attempts only send the man over the edge. According to the writers’ commentary on this episode, this episode did not resonate with fans of the show immediately. Apparently, it proved to be one of the most polarizing of episodes. But to me, this is one in which the writing really shines and I think it was always an instant classic. Frank Grimes is a hard-worker and does everything the way things are supposed to be done, with little to show for it. Homer, on the other hand, skates by in life, barely surviving his own stupidity, but has plenty to show for it: a loving family, a beautiful home, and lobster for dinner. This is what infuriates Grimes and this is the main conflict of the episode. This episode is cut from the same cloth as the previous entry “Two Bad Neighbors” in that it deals with an outsider coming to Springfield and being down-right appalled at the antics of The Simpsons (more specifically, here, with Homer). What I always find interesting about these episodes is that these outsiders more than have a point in their criticism, but the town seems to turn a blind eye to The Simpsons’ flaws. Grimes is basically in his own Twilight Zone scenario where Homer’s sloth and idiocy is more or less rewarded and he can’t get anyone to see his point-of-view. And we don’t really see it either as we are not meant to agree with him, either. It sort of leaves you with a feeling that there’s absolutely nothing gained or lost from this episode; while the demise of Grimes is shocking and sad for him, its status quo for us and the residence of Springfield. 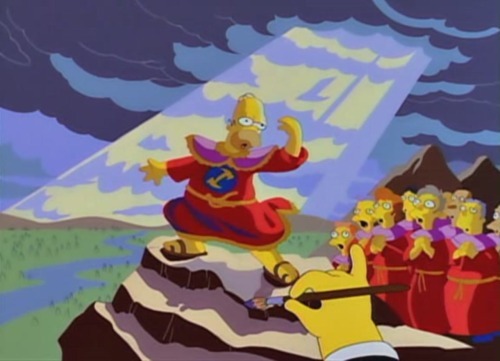 PLOT: Homer joins a secret society, then is quickly identified as “The Chosen One” but his new-found power comes with the price of alienating his friends. This is a classic in every sense of the word, as most of the upcoming episodes will be. But this is probably one even the casual Simpson fan is familiar with and with good reason. It’s a fantastic episode, with some Grade A Simpsons humor and some actual human emotion rarely scene in Homer-heavy episodes. The plot is one that is hilarious and heartfelt. Homer finds out about a secret society, the Stonecutters, in which basically all of Springfield’s men are members: Lenny, Carl, Moe, Mr. Burns etc. Eventually, Homer becomes a member and through fate, thanks to his birthmark, is celebrated as “The Chosen One” and is treated like royalty. But this status comes at a price. While his absolute power is fun for a while, Homer starts to get bored with getting his way all the time and when he tries to use his power to do some good, he turns off his fellow members, who want nothing more than to drink beer and carouse. This episode taps into one of Homer’s anxieties and one that is completely relatable: the fear of being left out. Flashing back to a childhood anecdote, this episode gives us one of the saddest (though, hilarious at the same time) chapters in young Homer’s life: The No Homers Club. Heartbreaking may be over-selling it, but it is sad to see Homer left out as its something we have all probably experienced at least once.